Why Sponsor the SciPy 2018 Conference? SciPy is pleased to offer sponsor tables which throughout the conference portion (July 11-13) as well as a Job Fair (July 11). Sponsors who choose to participate will have a chance to meet with attendees and discuss opportunities and potential fit. SciPy brings together some of the best minds in scientific and analytic computing, 25% of them students; you’ll be hard-pressed to find this kind of audience anywhere else. Our job fair and sponsorship tables are positioned in the heart of the conference. The tables rim the opening night reception area and remain up in the break area through the three days of the conference. SciPy 2018 will be funding both students and scholarship recipients who are just beginning their career as well as core developers who are instrumental in moving the community forward. If there is a particular group you wish to support with your sponsorship dollars, please let us know. Please email jillc@enthought.com or call 512-537-1056 with any questions or to reserve your sponsorship package. Download the sponsorship prospectus here. If your company benefits from the Python Open Source Libraries, consider giving back by funding the attendance of sprint leaders and core developers at our programming sprints. Sprints gather together core developers and others interested in the specific library or package to push forward new features or improve the existing code base. The financial aid will encourage more sprints at SciPy, yield significant package improvements, and ultimately increase the number of new contributors to core packages in the SciPy community. This 2 day event includes hands on Scientific Python instruction, a field trip to the Texas Advanced Computing Center, and presentations by scientists who will talk about how they use Python and other languages to solve interesting scientific problems. The Teen Track is designed to get attendees excited about the intersection of Science and Technology and expose them to the wide variety of careers that use scientific computing. The Teen Track offers a unique opportunity, the track may be branded on all materials as the SciPy Teen Track sponsored Your Company Name. 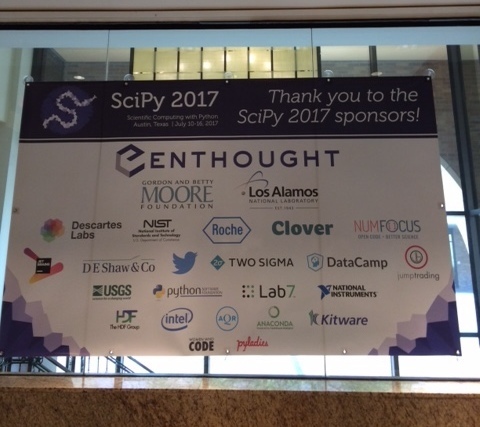 How Will My Sponsorship Help the SciPy Community? Your sponsorship helps us build a financial foundation for the conference and the community, providing more opportunities for the community to build out the Python scientific computing tools and packages. SciPy offers scholarships for students and researchers who contribute to the community. In the last 10 years over 130 students have attended from countries around the world. Sponsorships also help us to keep this meeting very affordable compared to many others. “[I really enjoyed] getting to meet so many new people with similar interests and who are working on the projects I love. Also I loved learning about new tools and projects people are working on." “The entire conference was top notch. The talks were so informative and I learned a ton."